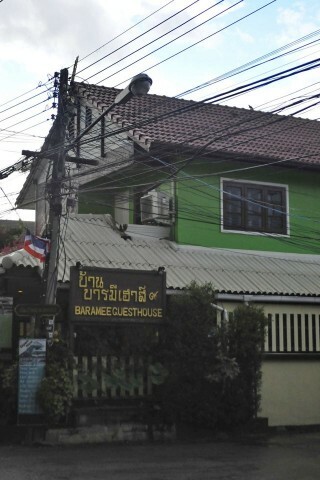 Tucked down Soi Sunpanad, off Phaholyothin, but hard to miss with a vivid green paint job is the very good Baan Baramee. Ad Book now! Rates from US$16.02++. Average rating 8.2 from 325 reviews. With a convivial atmosphere and friendly staff plus a cosy downstairs seating area, it’s a welcoming little spot. Behind the small cafe, where you can consume your complimentary breakfast, and the information and reception desk is a two storey block with a selection of comfy, good value rooms. There are several room styles, but to keep things simple only two different prices, so have a nose around, see what is available and which best fits your budget and requirements. All are pleasantly decorated and clean with air-con, WiFi and modern en-suite bathrooms equipped with hot showers. Ground floor rooms are naturally less bright with no view but larger in size while smaller first floor ones have seating outside on a communal terrace. They have double/single rooms, where a large bed fills most of the room, though the bright, airy twin bed options come with sliding French doors. All are good value for what you get plus there’s only a 100 baht supplement for high season.